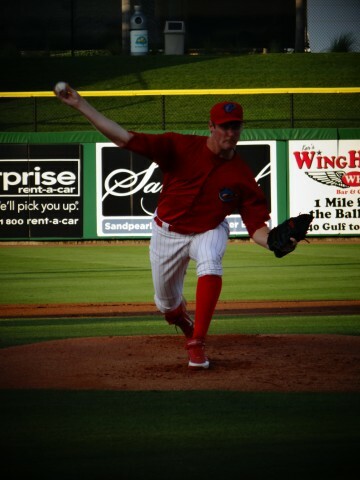 Clearwater, Fla. –Surry, BC native Chad Stang (above) of the Brevard County Manatees singles off fellow Canadian Colin Kleven of Kamloops, BC who was pitching for the Clearwater Threshers tonight at Bright House Field. Stang latter scored from second but not until Kleven made five attempts to pick his off first. Brevard County won 5-2, with DH Cody Hawn leading the way. Hawn was 3 for 4 with the big hit coming in the visitors half of the second, a two-run homer. 2B: Macias, B (3, Kleven). HR: Hawn (2, 2nd inning off Kleven, 0 on, 0 out), Garfield (4, 5th inning off Kleven, 0 on, 2 out), Rivera, Y (1, 8th inning off Giles, 0 on, 2 out). TB: Macias, B 2; Dishon; Rivera, Y 5; Hawn 6; Ramirez, N; Roenicke 2; Stang; Hopkins; Garfield 4. RBI: Hawn 2 (7), Roenicke (3), Garfield (10), Rivera, Y (1). 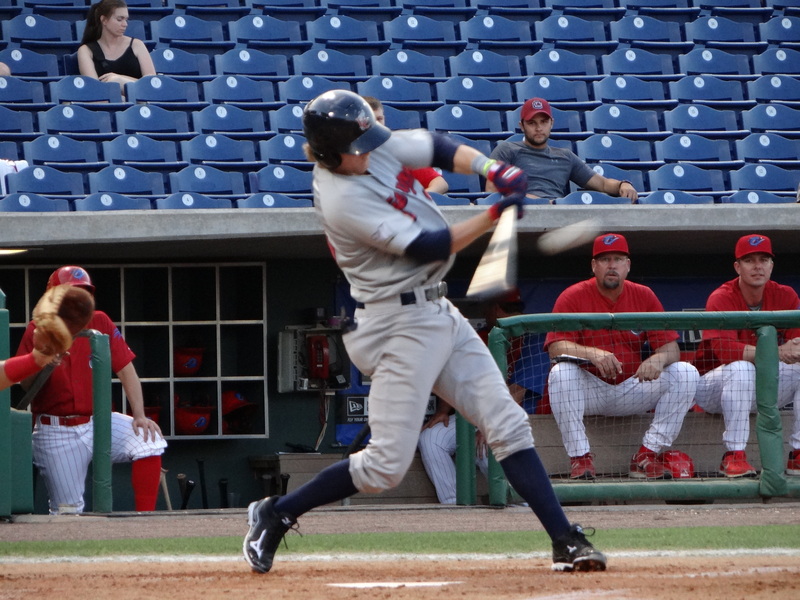 2-out RBI: Hawn; Garfield; Rivera, Y. Runners left in scoring position, 2 out: Macias, B; Stang. SB: Stang (5, 2nd base off Kleven/Moore, L). CS: Roenicke (3, 2nd base by Kleven/Moore, L), Hopkins (1, 2nd base by Broussard/Moore, L). E: Barnes, J (1, throw). Pickoffs: Shackelford (Serritella at 1st base). TB: Serritella 2; Alonso 3; Mojica 2; Perkins; Martinez, H.
RBI: Alonso (7), Mojica (7). 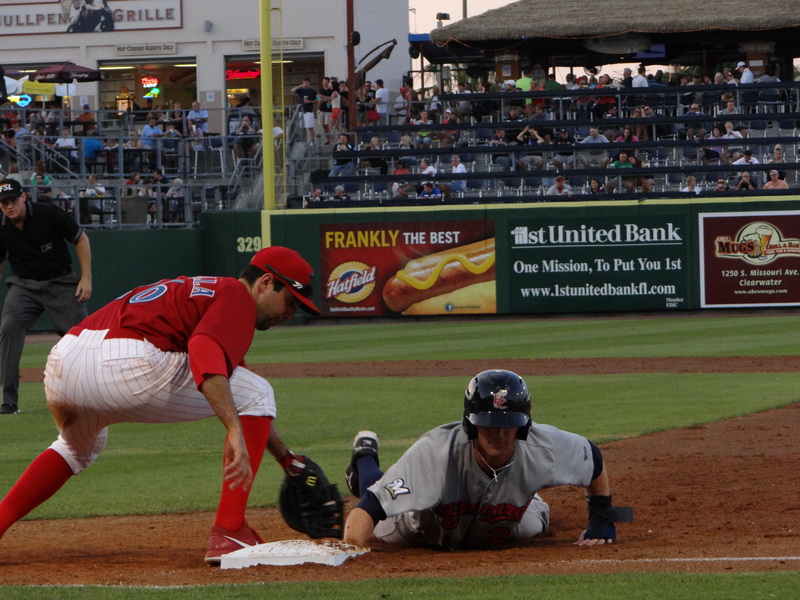 Runners left in scoring position, 2 out: Altherr; Serritella 2; Franco. CS: Perkins (2, 2nd base by Miller, M/Garfield). PO: Serritella (1st base by Shackelford). Groundouts-flyouts: Barnes, J 4-7, Miller, M 2-1, Shackelford 1-3, Kleven 3-4, Broussard 1-1, Giles 0-0, O’Sullivan 2-1. Batters faced: Barnes, J 22, Miller, M 7, Shackelford 9, Kleven 23, Broussard 8, Giles 5, O’Sullivan 4. Inherited runners-scored: Shackelford 2-0, Broussard 1-0. Umpires: HP: Ryan Additon. 1B: Ryan Clark.